Renal parenchyma perforation and perirenal hematoma are very rare complications following double-J ureteral stent insertion. In fact, to the best of our knowledge, only four such cases have been previously reported in the literature. Nonetheless, such a situation may be life-threatening if not promptly detected and treated. Herein, we report a case of renal parenchyma perforation and perirenal hematoma after ureteroscopic lithotripsy and double-J stent insertion. A 67-year-old female was admitted to the emergency department of our hospital in New Taipei City, Taiwan, following symptoms of fever, hematuria, nausea, vomiting, and abdominal pain for 1 day. The patient had a history of left renal stones, status post-shock wave lithotripsy three times, diabetes mellitus, and hypertension under regular medical control. The patient's initial vital signs showed a high fever up to 39.5°C, tachycardia up to 125 beats/min, and blood pressure was 105/68 mmHg. A physical examination revealed left costovertebral angle knocking pain. A hematological examination showed leukocytosis (18,000/mcL). Furthermore, a urine analysis showed both pyuria (>100/HPF) and hematuria (>100/HPF). The kidney-ureter-bladder (KUB) film showed radiopaque density over the left sacroiliac region and a suspected middle ureteral stone. An abdominal computed tomography (CT) scan showed left hydronephrosis, a left middle ureteral stone with a length of approximately 1.3 cm, and bilateral renal stones [Figure 1]. Under the impression of acute pyelonephritis and left ureteral stone, the patient was admitted to the general ward for further care. After admission, cefmetazole was given for urosepsis control. Moreover, once the fever subsided, ureteroscopic lithotripsy was arranged. Hypoxia (SpO2: 85%) and hypotension (85/57 mmHg) were noticed in the recovery room. Urosepsis was suspected, and hence, the patient was transferred to the Intensive Care Unit for aggressive treatment. 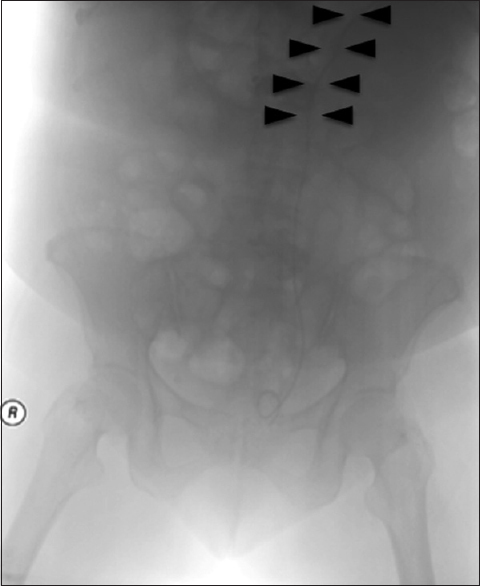 A follow-up KUB showed an inappropriate double-J stent position with an inadequate proximal curve in the renal pelvis [Figure 2]. A hematological exam showed acute blood loss (Hb: 8.8 g/dL, 2 days prior: 13 g/dL). 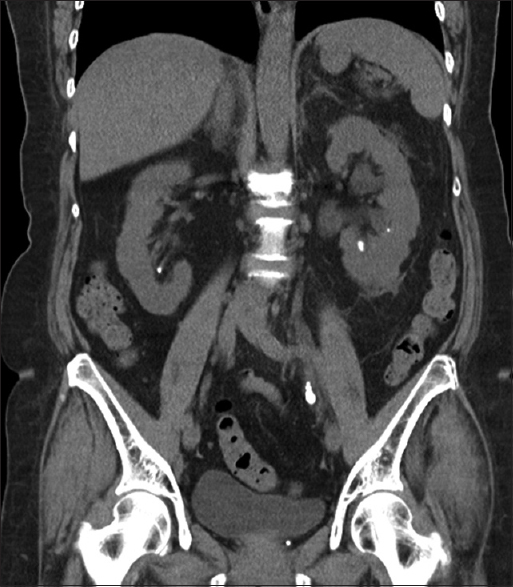 In addition, an abdominal CT with contrast revealed left perirenal hematoma and double-J stent penetration through the renal parenchyma [Figure 3]. Blood transfusion and transamin were given. Following stabilization of the patient's condition, she was transferred back to the general ward and discharged 1 week later. The double-J stent was removed 1 week after discharge, and a follow-up renal echo confirmed subsidence of the left perirenal hematoma. Figure 3: Abdominal computed tomography showing left perirenal hematoma and double-J stent penetration through renal parenchyma. Although double-J stent insertion is considered to be a very low-risk procedure, complications may nevertheless arise, including urinary tract infection, stent migration, and incorrect placement. Under extremely rare circumstances, renal parenchyma perforation may also occur. According to a literature search, only four such cases have been previously reported [Table 1]. The mean age of the affected patients (including that in the present case) was 56.0 ± 13.5 years (range: 35–67 years). Among the five patients, three (60%) were female, three (60%) had a history of shock wave lithotripsy for renal stones, two (40%) had a solitary kidney, and two (40%) had diabetic mellitus. Four of the patients underwent ureteroscopic lithotripsy, and one underwent pyeloplasty. After surgical intervention, three (60%) patients exhibited significantly decreased hemoglobin and two (40%) presented with shock. In most cases (80%), the complication was initially detected by KUB film, which revealed an inappropriate positioning curve of the double-J stent. CT scans were then performed for confirmation. All of the cases underwent conservative treatment with blood transfusion or repositioning of the double-J stent. All of the patients received a stable prognosis. Regarding the possible mechanism in the current case, we hypothesized that the relative weak renal pelvis wall of the infective kidney was initially injured by the guidewire. The tip of the guidewire is relatively sharp; and moreover, the guidewire is placed blindly, thereby increasing the risk of guidewire penetration. The penetration leads to bleeding of the surrounding vessels and subcapsular hematoma. The double-J stent was then likely forcefully advanced through the defect of the renal pelvis. Following removal of the guidewire, the tip of the double-J stent most probably became snagged in the defect; thus, preventing the proximal side from forming an adequate curve. Early detection of inappropriate double-J stent positioning and hematoma formation, combined with early treatment, is essential in preventing progression of the complication. We thus recommend the use of KUB film and renal echo immediately after the operation, if the vital signs are not stable. 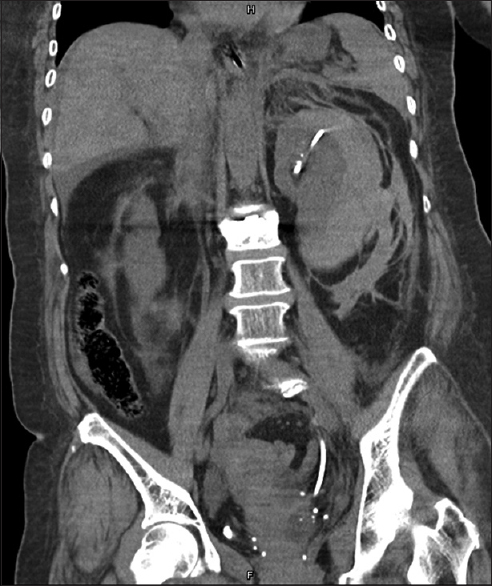 If perforation with hematoma formation is suspected, abdominal CT should be considered. In the case reported in this letter, hypotension and hypoxia were detected after the operation and were thought to be signs of urosepsis. However, on discovering inappropriate proximal curling of the double-J stent, a CT scan was arranged which showed perforation of the renal pelvis and perirenal hematoma. The management of such iatrogenic renal trauma depends on the severity of injury. Minor injuries are generally treated conservatively, for example, through close observation of the patient's vital signs, blood transfusion, and follow-up imaging. By contrast, significant or persistent injuries require immediate intervention with angioembolization and, if necessary, further surgery. In conclusion, the placement of a double-J ureteral stent is a common procedure in the urological field and is generally regarded as a low-risk procedure. However, rare complications such as renal parenchyma perforation should always be borne in mind. This letter has described a rare case of renal pelvis perforation and perirenal hematoma following double-J stent insertion accompanied by the presentation of hypotension and a significant reduction of hemoglobin. Postoperative KUB is beneficial in ensuring early detection and may reveal an inappropriate positioning or curling of the double-J stent. The management of the subsequent iatrogenic renal trauma should be determined in accordance with the severity of the injury. Reynard J, Brewster S, Bier S. Stone disease. Oxford Handbook of Urology. Ch. 9. Oxford, UK: Oxford University Press; 2013. p. 724. Dündar M, Calişkan T, Koçak I. Unexpected complication: Renal parenchymal perforation with double-J ureteral stent. Urol Res 2008;36:279-81. Nomikos MS, Chousianitis Z, Georgiou C, Georgellis C, Rikas P, Anagnostou T. Renal parenchyma perforation and hematoma formation following double-J stent insertion in a solitary functioning kidney: An unusual complication. Case Rep Urol 2012;2012:301275. Gönülalan U, Akand M, Hasırcı E, Koşan M. An unusual complication of a double-J ureteral stent: Renal parenchymal perforation in a solitary kidney. Turk J Urol 2014;40:245-7. Altay B, Erkurt B, Kiremit MC, Güzelburç V. A rare complication of ureteral double-J stenting after flexible ureteroscopy: Renal parenchymal perforation. Turk J Urol 2015;41:96-8. Summerton DJ, Kitrey ND, Lumen N, Serafetinidis E, Djakovic N; European Association of Urology. EAU guidelines on iatrogenic trauma. Eur Urol 2012;62:628-39.